A rollback to the Vehicle Assembly Building for tank inspections is not part of the current testing scenario being planned. A heavily-instrumented fueling test to examine the external tank during cryogenic loading will happen by late December at launch pad 39A. The complex test will involve removing foam, installing sensors on the tank and then putting new foam on to simulate a flight-like condition. Specific details and the schedule should be defined by the middle of next week. This delay for Discovery also has the ripple effect of postponing the previously planned February 27 launch of Endeavour until approximately April 1 at 3:15 a.m. EDT (0715 GMT). 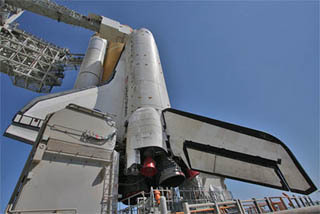 Launch of space shuttle Discovery is being postponed until next year due to the ongoing efforts to understand and resolve the structural cracks on the external fuel tank. Unable to clear the shuttle for liftoff during the upcoming December 17 through December 20 launch period, the mission will remain on hold until the next available window opens on February 3 at 1:34 a.m. EST (0634 GMT). This lengthy gap in launch opportunities is driven by restrictions against flying a space shuttle to the International Space Station. Unfavorable thermal conditions during most of January prohibit a shuttle from being docked to the outpost and the subsequent arrival of a Japanese cargo craft push Discovery's next chance into early February. The window Discovery now aims for opens February 3 and stretches through February 10. The following window would open on February 27 and extend to March 6. NASA will use the next two months to conduct extensive testing both on the shuttle and ground articles. NASA has called for a news conference at 12 noon EST (1700 GMT) today to provide an update on the space shuttle Discovery situation. We'll stream it live right here on this page. Participants of the briefing will be Bill Gerstenmaier, associate administrator for Space Operations, John Shannon, space shuttle program manager, and Mike Suffredini, International Space Station program manager. After a long holiday weekend with no work scheduled at launch pad 39A, activities have resumed today to install dots on the ground umbilical carrier plate as markers to illustrate any movements by the GUCP during fueling operations. 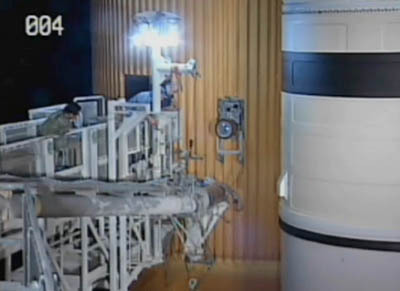 Meanwhile, the analysis work on the external tank stringer cracks continue. The next major meeting of program officials is planned for this Thursday. Check out the latest updated story on shuttle Discovery's delay that includes details from today's NASA news briefing. If Discovery ultimately gets cleared for launch on December 17, the shuttle would dock to the International Space Station on December 19, conduct the mission's first spacewalk on December 21, install the Permanent Multipurpose Module on December 22, perform the second spacewalk on December 23, hold a joint news conference and say farewell to the station crew on Christmas, undock on December 26 and land at Kennedy Space Center in the late afternoon on December 28. DELAY. Launch of space shuttle Discovery has been postponed until the next window that opens no sooner than December 17 at approximately 8:52 p.m. EST, engineering sources say. The space agency will hold a news briefing later today to provide an update on the shuttle situation. NASA is to hold a news conference at 3pm EST (2000 GMT) to discuss the outcome of today's meeting on the repairs to Discovery's external fuel tank. The news conference participants will be Bill Gerstenmaier, associate administrator for Space Operations, and John Shannon, Space Shuttle Program manager. Watch the news conference live on this page. NASA and contractor managers and engineers gathered Wednesday to review the status of repairs to fix cracks and damaged foam insulation on the shuttle Discovery's external tank and to discuss an ongoing engineering review before deciding whether the ship can be safely launched as early as Dec. 3. The target launch date for space shuttle Discovery has been pushed back to Friday, December 3 at about 2:52 a.m. EST (0752 GMT). The delay gives the program additional time to analyze and repair the external tank problems that have held up Discovery's final mission. A review of the work is planned for next Wednesday, November 24, followed by a senior meeting to assess the "flight rationale" on Monday, November 29. We'll have a full story shortly. An environmental enclosure has been built around front face of shuttle Discovery's external fuel tank, establishing a controlled worksite for repairing the metal stringer cracks and spraying new foam on the tank. The decision to proceed with erecting the tent-like structure was made Saturday and the work was finished on Sunday. Meanwhile, activities continue on the backside of the tank where technicians are installing the new ground umbilical carrier plate to fix the gaseous hydrogen leak in the venting line. An initial torque was applied Saturday and the new step in the prescribed tightening sequence will occur on Monday. A leaking hydrogen vent line attachment fitting on the side of the shuttle Discovery's external tank was removed and disassembled overnight, revealing an unevenly compressed internal seal. The quick-disconnect hardware also may have a less concentric fit than pre-fueling measurements indicated. An analysis is underway to determine if the defects are responsible for the gaseous hydrogen leak that grounded Discovery last Friday. The gaseous hydrogen vent arm extending from the launch pad 39A tower to shuttle Discovery's external fuel tank was detached tonight and lowered down about 8:25 p.m. EDT. This will enable the technicians access inside the leaky ground umbilical carrier plate. Technicians are busy today, as seen in our live streaming video coverage, working to unhook ordnance and disassemble the ground umbilical carrier plate. This is the first opportunity for engineers to get their hands on the GUCP since last Friday's gaseous hydrogen leak. The target liftoff time on November 30 has been revised by a few minutes to 4:02:44 a.m. EST (0902:44 GMT). Check out the latest chart of launch windows. And see our revised flight plan with the detailed timelines of the mission based on the new launch time. A day after the shuttle Discovery's flight to the International Space Station was put on hold, the launch pad's service structure was rotated back around the spacecraft this morning. Weather protection panels to cover the ship's wings were slid into position a short time ago. Boiloff of residual hydrogen in the external tank was finished before dawn. Technicians have not yet gained access to the trouble spot on the backside of the tank. They'll have to extend a catwalk from the pad's tower to reach the Ground Umbilical Carrier Plate where the gaseous hydrogen leak occurred during Friday's countdown. Engineers are formulating plans for inspections, tests and repairs to fix the problem. The external tank foam crack also needs to be resolved before Discovery can fly, which is targeted for no sooner than November 30. And check out the revised flight plan with the detailed timelines of the mission based on the new launch date.